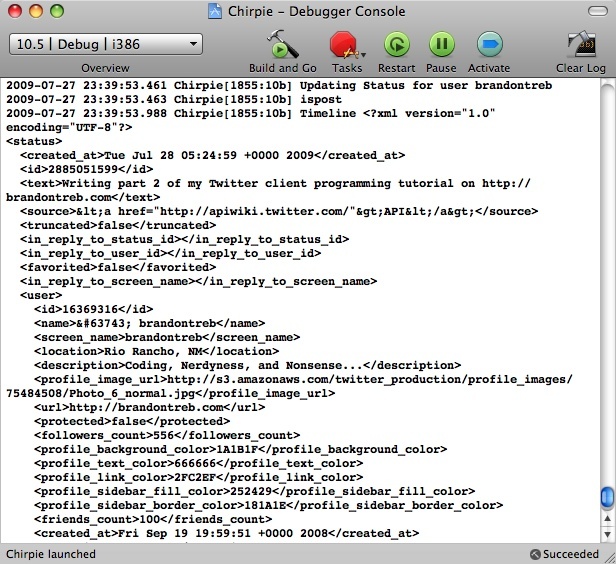 This is part 2 in our series about creating a Twitter client in Objective-C. In case you missed it, here is a link to part 1 of this series. In the last tutorial I showed you how to retrieve data from Twitter and display the XML in the Console. Today, we will be focusing on sending messages to Twitter via POST. We will be implementing the code to update our Twitter status. So let’s just dig right in. We have added two properties. The first isPost will be true when we are calling a method that requires a POST to Twitter. This will be methods such as update_status, follow, etc… Next, the variable requestBody will hold the POST arguments that will be sent to Twitter. These will be things such as status text or friend id. Finally, we will be adding a method called statuses_update. The reason I named it this is because that is what the method is called in the Twitter API. 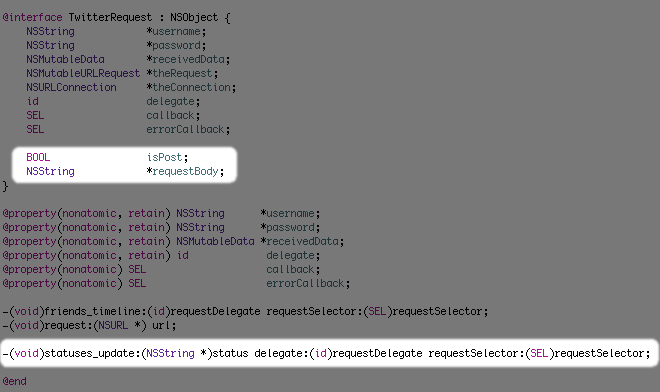 Like our friends_timeline method, it takes a delegate and selector to call when the request is complete. Important: I didn’t highlight this in the screenshot but make sure you change theRequest from an NSURLRequest to NSMutableURLRequest. It will give us some additional methods to set up the POST. I’ll start by explaining the status_update method. We first set the global isPost property to true. This will tell the request method to make a POST. The next 2 lines set the callback stuff as we did before. The only new line here is setting the requestBody variable. This is just a string that looks like “status=new twitter status”. The addition to the request **method is what will allow us to POST to Twitter. First, we check if the **isPost property is set. This will be true if request is called from our status_update **method. Next, we call the **setHTTPMethod of the request to POST. This is pretty obvious. The following line let’s Twitter know the type of data that we are sending to it. Next, we call setHTTPBody to set the body of the request. At some point we will want to URL Encode this string, but that will be for a different tutorial. Just don’t use any special characters such as & and = in your update to Twitter right now. All that is happening on this line is we convert the string to NSData using the **dataUsingEncoding **method of NSString and set it to the HTTPBody. The last line just sets the Content-Length property to the length of our string. This is needed to correctly do a POST. One thing to notice here is I commented out the line to get the friends timeline. This is because having both requests running at the same time with the same request object could cause conflicts. The best way to approch this to create an entirly new TwitterRequest object. I just wanted to keep it short. It’s basically all of your personal profile information. That’s it for today. If you have any comments or questions, feel free to leave them in the comments of this post or write me on Twitter. You can also download the source for this version below.